One of the reasons why the city of Jaipur is a popular tourist attraction is because of the various festivals that are celebrated here with enthralling gusto and fervor. In fact, the pillar with five lamps (popularly known as Paanch Batti), right in the middle of the Mirza Ismail Road, proudly displays a signage: ‘Pinkcity: The Festival City’. 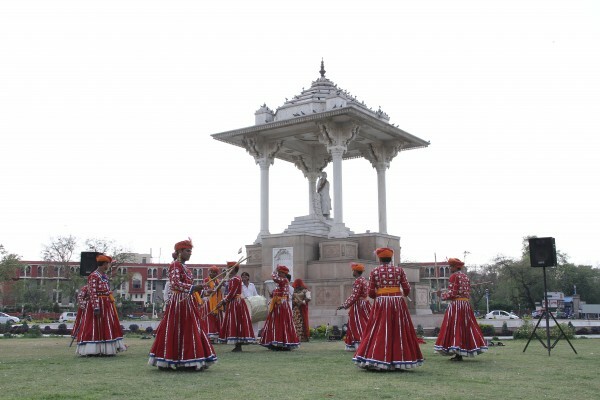 While the traditional festivals like Gangaur and Teej haven’t lost their charm, some ‘new’ celebrations have been added by the Deprtment of Tourism of Rajasthan to the city’s cultural life with the increase in the number of tourists visiting the city. 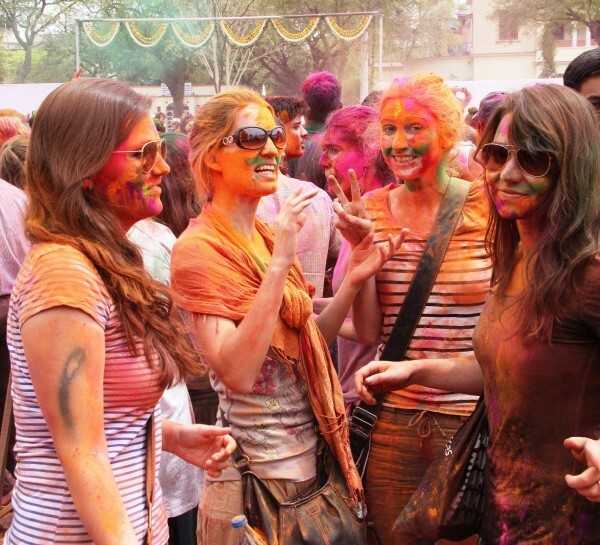 Dhulandi, the festival of colours is celebrated each year in March in the morning at Khasa Kothi. 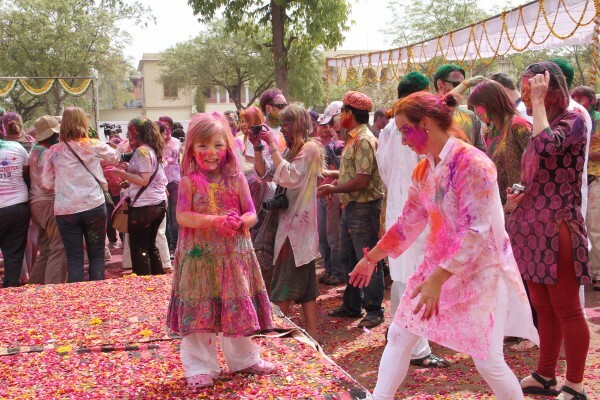 The tourists get an opportunity to smear each other with gulal (dry colour)as they shake a leg to the traditional Holi folk songs. Later, a gratis city tour by the bus is organized for those who would like to go around Jaipur to witness the festival in its colourful hues. The annual Kite Festival (Makar Sankranti) is held at the Jal Mahal Ki Paal next to the Man Sagar lake each year. Over the years, this kite festival has become a special attraction. not only for the Jaipurites but also for the domestic and the foreign tourists visiting the city. An exhibition of kites, demonstration of fancy kites as well as a kite flying competition also takes place. The tourists try their hand at kite flying. City’s well known kite flyers are invited to display their skill at kite flying – with some of them flying even more than 100 kites on one string. 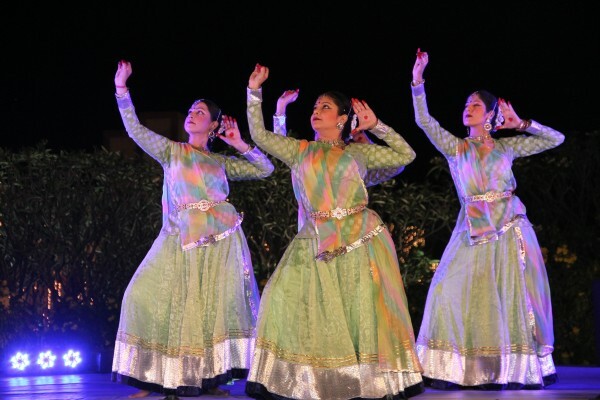 The festive atmosphere is further enhanced with cultural performances by local folk artistes. The traditional cuisines of Makar Sankranti like ‘Til-Ke-ladu’ and ‘Dal-Ke-Pakoras’ are enjoyed by the tourists. To celebrate the Founder’s Day (30 March) of the state of Rajasthan, Rajasthan Divas Celebrations (RDC) are a week long bonanza of cultural and classical events. Some well known artistes of national fame come to the city to perform – as do the state’s musical troupes. The ethnic food, art & craft fair, theatre, special prayers also mark the occasion. The RDC held in the last week of March every year. During Deepawali, the festival of lights, a two-day ‘Deepotsav Festival’ is held in the city also at Jal Mahal Ki Paal which is decorated with ethnic hangings, buntings, flowers, rangolis, mandanas, and diyas. The visitors get to see a melange of colourful Rajasthani folk performances with the spectacular backdrop of illuminated Jal Mahal. 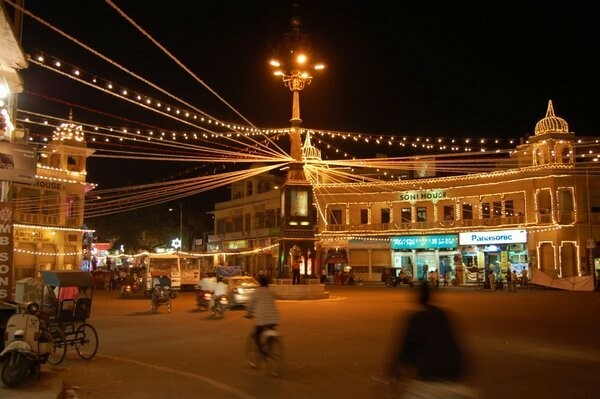 The walled city of Jaipur is decorated beautifully with gleaming lights and the festival celebrations of both the local people of Jaipur as well as the tourists cannot be completed without taking a tour of the walled city at night. While talking about the festivals of Jaipur, the mention of Gangaur and Teej is inevitable. 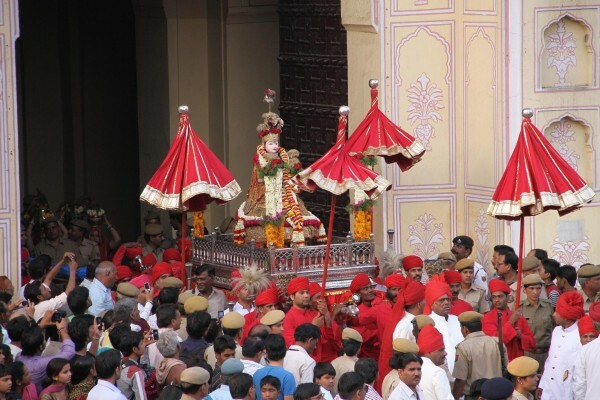 Gangaur is one of the most important local festivals in Rajasthan. In some form or the other it is celebrated all over Rajasthan. “Gan” is a synonym for Lord Shiva and “gauri” or “gaur” stands for Goddess Parvati, the heavenly consort of Lord Shiva. Gangaur celebrates the union of the two and is a symbol of conjugal and marital happiness. Gangaur is celebrated in the month of chaitra (March-April), the first month of the Hindu calendar. This month marks the end of winter and the onset of spring.This festival is celebrated especially by women, who worship clay idols of “Gan” & “Gauri” in their houses. These idols are worshiped by unmarried girls who seek the blessings of Gan and Gauri for a good husband, while the married women pray for the good health and long life of their husbands.This worship which starts form the first day of the chaitra month culminates on the 18th day into Gangaur festival with a great religious fervour. On the eve of Gangaur festival, women decorate their palms and fingers with henna. The idols of Gan and Gauri are immersed in a pond or in a nearby lake on the last day of the festival. Celebrated in Rajasthan in August, a festival to rejoice the colours, crisscross green-yellow lines, mehandi and rains this swing festival welcomes the advent of the monsoon. The festival is also dedicated to Goddess Parvati and commemorates the day when she was united with Lord Shiva after a penance of a hundred years – making them a symbol of an ideal marriage. It is believed that invocation of Parvati’s blessings on this day results in continued marital bliss. 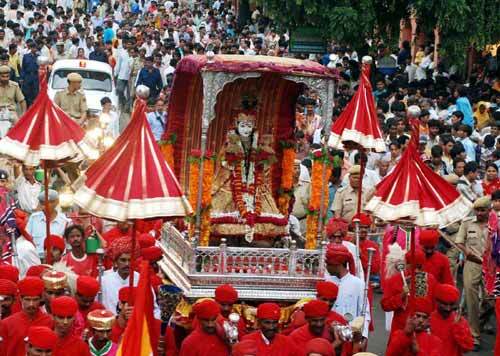 The palanquin of Goddess Paravati is carried by eight men dressed in red. Though celebrations are held all over the state, it is particularly colourful in Jaipur where a procession winds its way on two days through the old Pink City. Basically a women’s festival, Teej falls on the third day of the bright fortnight of the month of Shrawan (July-August). The images of Parvati or Teej Mata are bedecked in new clothes and jewellery and worshipped. Then the images are taken out in ceremonial processions escorted by caparisoned camels and horse drawn chariots, as the bride Parvathi leaves her parents home for her husband’s. The devotees surges to catch a glimpse of the deity and seek blessings. Teej is one of the most widely celebrated festivals of Jaipur. 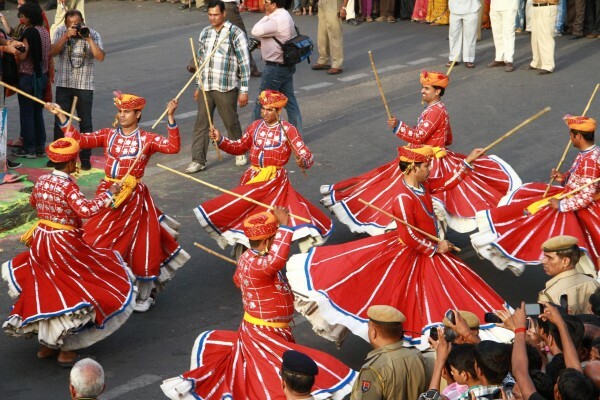 Swings, traditional songs and dancing are the unique features of Teej celebrations in Jaipur. Women perform traditional folk dance and sing beautiful Teej songs while enjoying their sway on swings bedecked with flowers. Swings are hung from trees and decorated with flowers. Young girls decorate their hands and feet with henna in delicate designs. The popular belief is that darker the henna the more a man loves his woman. Girls engaged to be married receive gifts such as a dress, henna, lac bangles and sweets from their future in-laws and married women, from their parents.